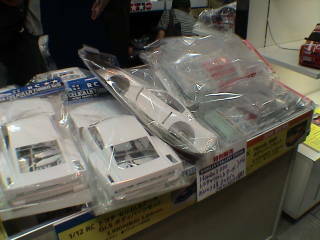 Plastic Models Tamiya問UTA first in the world, “Yamato” is now. 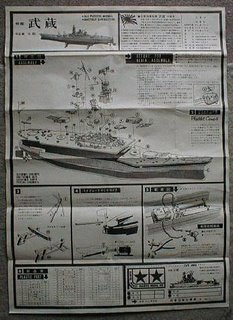 Once in our laboratory, “the first Tamiya Plastic Model,” Musashi “” They did a paper, and then “All work Tamiya Model 3” kit, the first editor of the interview process, “Yamato” was was determined. This former “Musashi” to introduce a substantially revised and enlarged was introduced as a paper. It is known to be surprising, said former president of Tamiya Yoshio Tamiya (Shunsaku president’s father), before the war had operated a transport business. As well as trucking, bus and taxi routes, the company has grown in Shizuoka or two to fight. But the outbreak of the Pacific War, the military KARIDASA most vehicles, and never come back again. From Shizuoka in 1946 and burned down a year early “Tamiya commercial joint stock company” the birth of the birth of the woodworking sector earnings increased timber handling relationships. So now it’s time to 1951 when the factory burnt down in a short circuit. Tamiya甦TTA phoenix-like motorized wooden tanks and wood But soon afterward, “Musashi” to the growth model leading manufacturer of wood and bound by the hit, and the introduction of new milling machine to automatically cut out the wooden hull, When it looked very smooth sailing from the U.S. Many好事Magic “Black Ships” is done. “Black Ships” and the identity of the model. Shunsaku shock us, and it was now far ahead of the imagination. 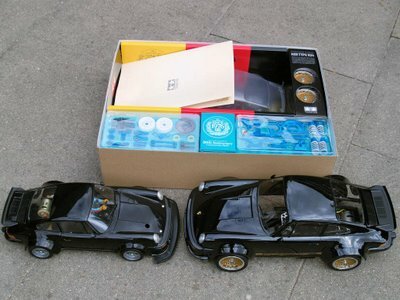 “What is a toy like that, but wrong way, not a model” not as the head振RI切ROU times. The answer is simple, I had accepted the model at the moment I first saw his Shunsaku. Switch connections to the whole model, or until a wooden model of it and will throw away, and no knowledge. I was selected to model the time path of future cusp still spread. 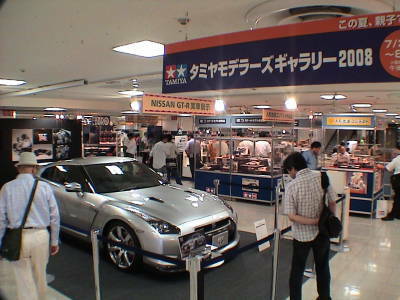 Tamiya登RITSUMERU the top manufacturers in the world just 10 years later “decision of the century”. 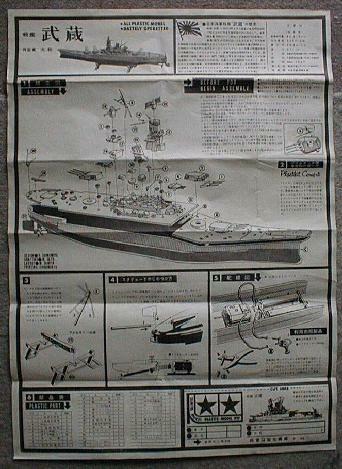 Tamiya model should be the first anniversary of the issue of a battleship “Yamato”. Hard luck story hard to describe the development of the great book “Tamiya business model” as a delegate to the (in this book is the first kit, “Musashi” is treated as not decline in value of any book in this that we will know), let’s look at the kit immediately. This kit is the first book, setting the initial price was 500 yen but, at the price of the Yamato was launched on the eve of the Nichimo Corporation, launched the lower 300 yen in tears. The price at the time of this release are several theories. 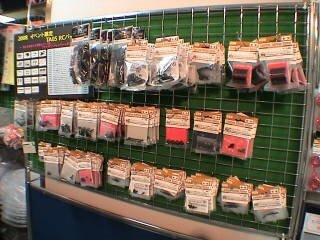 At the time, “Price” does not exist, “about 000 yen” is the expression that was used from the article in the newspaper ads or Tamiya Model ￥ 300 cases in Japan have found that it is correct to. First edition had been stored in our laboratory, “Yamato” in the ¥ 300 price sticker stuck to the surface, was also little support. As we passed the point of the kit is sufficient (Nichimo Corporation was overwhelmed and he) did, and it was rather large in relation to a scale model of the Nichimo Corporation’s competitors in forming red color below吃水線TSUTONKARA and was able to reproduce the painting is not required but, with the length of the day Nichimo Corporation, the result was defeat. In the box and then change “Musashi” by changing colors and forming “Golden Yamato”, the diversion of the lower hull only “Shinano” that began with the history of the blockbuster. Box art is a powerful hit on the hull and heavy leaden skies bloody, and totally different style of modern kit. 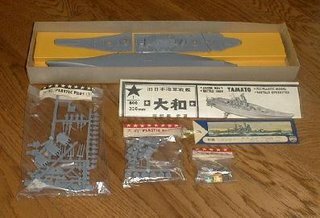 Most of the wooden warship of the Tamiya model, they then ask Hachiro Ueda Takeshi’s box art, this plastic model for some reason, “Yamato” is not only to ask Mr. Ueda. “Um … Well, this is not my picture of me,” Ueda OSSHAIMASHITA provide us with the artist. Different style of work and the other to mention it. 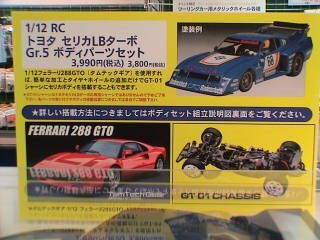 “All work Tamiya Model 3” or looking for work than ever as the publication of a few could not be confirmed because it absolutely made it to the final candidates for the author is not mentioned. If you or anyone you know, please let us know if our laboratory, thank you. Let’s look at the top box again. 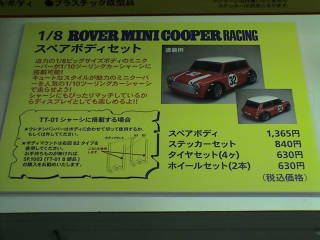 Era model is imported, which the English have in mind passim. 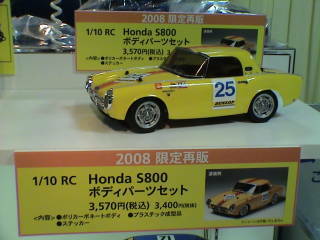 Proudly and 1 / 800 scale輝KIMASHITA in the round. Layout is high above the hull is made further steps to open a cardboard box and yellow. 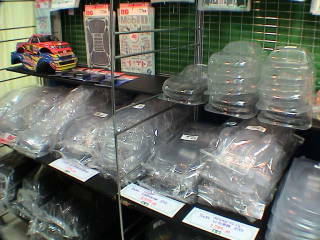 And individual and look at the parts. . .驚KIMASU! Stadimeter go on the bridge is an integral molding, and a hole right through the mesh! ! I think you’re in great shape and to look at the actual photo. It is surprising that the full description. First, write the name of the staff. He is a barber-shop lovers Shinomiya Hatsuzi Yaizu warship designed to hit, so we had to write several times before drawing the wood kit. Shunsaku as president and layout (at the time of planning? )督husband’s younger brother (then a university student) are also named. Mastermind? It is the name of his venture’s obsession with the奥YUKASHI残SANAKATTA Shunsaku still continues. 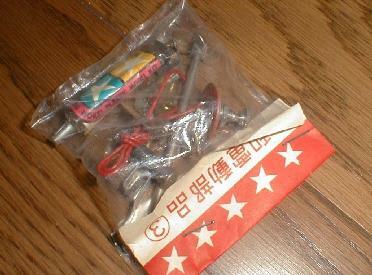 One of the parts list, assembly kits, not only “material” was found in the value of a guaranty that the study is making. Is to have a card from the time it is part of the surprise request. I feel obliged in private, and whether it’s packed so much into the local agents from boyhood to why our laboratory assistant, but the kit is, of course, stick your letter with some trepidation about the loss of parts of elementary school clumsy words, a carefully to reach parts of the mass and color brochure to answer, “What is amazing Tamiya! I’m their friend!” is the early childhood experiences have impressed all. “Customer value” may seem trite slogans, and it was good practice from this period, “local agents of the world” We got off to a qualification. Ministry of Energy and the versatility of the metal accumulated during the performance model in wood, there is a sense of security. But. . . Could売REMASEN. 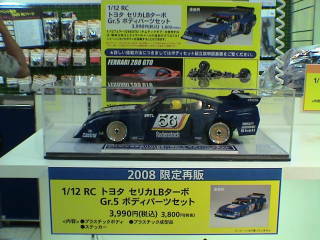 Change the color molding “Yamato” Golden also launched. “Gold” is like gilding the little brown mixed However, excitement is quite out of the box. Should also add that there was a minor change to the upper hull (see photo). Finally, “Shinano” appears. Speaking of vintage phantom of Shinano Tamiya 1 / 250 there is a wooden model, and release time to look into all things Super Deluxe wood 1 / 250 “Shinano” released in May of 1967, plastic model 1 / 800 “Shinano” released in June of 1967 ( “All work Tamiya model 3” is a mistake in the first five and I). I had to release it at around the same time. 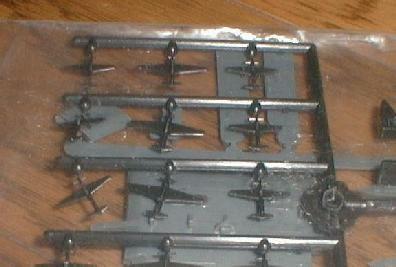 1 / 800 carrier-based aircraft is an excellent material to be molded with a propeller. Abridged from the switches and fittings, and also gently juveniles. And attention? Runner is put on the left hull. What do I do for a moment, the aircraft carrier on its structure (for a bridge, etc.) in the unsymmetric, I have a role in the prevention of tilt when the motor is running. If you run even if the kit is still a lot of time and know the kit is a symbolic part of showing compassion for the consumer. Beyond the space-time around 40 years from now is a renewed Tamiya 1 / 700 Water Line “Yamato” and “Musashi”, “Shinano” have been released and is praised for the geeks of the world fleet. 1 / 800 plastic models of his first novel, “Yamato” and “Musashi”, “Shinano” and its roots are also present as a witness in an important era. “All work Tamiya model 3” of 3 per film editing “Finished”捜SHIMASHITA. Tamiya Shizuoka in history, “Yamato” and “Yamato” Golden “Shinano” assembly kits are not saved are “finished”. Japan’s first plastic models club T P M C (Tokyo Plastic Model Association: Established 1962) Thank to cooperate willingly Touyama Takashi Hiroshi Mr. Chairman, the world heavyweight model in the early days of the inquiry There is not. 3 Gold Horse遊亭from the master先代”Gee we can not find the color I捜SHITA” When we receive a call directly and was going to swoon over the恐RE多. Be a major project of this nature are explored with imagination, before the “all work Tamiya model 2” that I had been edited out in parallel, our laboratory assistant is set around Harare I have been. “The big thing is御上to leave the world a history book.’s Save our laboratory,” Yamato “Golden” Shinano “SHIMAOU to make”. . .
We could not think of it as you say the choice is流石! Media Contact Tamiya慌TETA and U捜SHI出SHI get involved, contact the department came out in the table 35-years in the gold! ! Moment. . . But anyway 40 years ago in a mold, injection molding machine and modern equipment can not be attached to a different standard. Were also changed from joy to despair of the moment. The runner of a major part of the fruitful efforts made by officials to attach and small parts are not. Parts of this fine way to end up taking it out of replica cast in a mold by hand, it appeared that at last. 9 were on the calendar. September 25 was just given a last-minute sale of日NO本. After all the photos I received this completed the day out in the balancing act you have to bring in経NAI飛BI込MA no proof. “Yamato” and “Musashi”, “Shinano” 3 by the Hobby Show in Makuhari, Japan (2000/09/21) was exhibited to the Tamiya booth. Many people might think that all this揃TTA目出度KU was thinking about one to one and all. Yes, “Golden Yamato”. This entry was posted in Vintage on June 30, 2009 by admin. This entry was posted in Event Report on June 22, 2009 by admin. 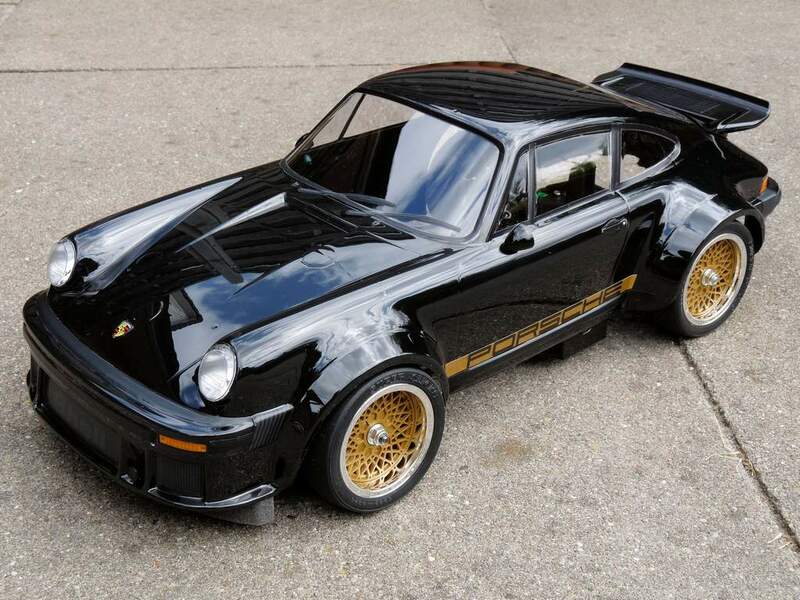 …I finally managed to realize an idea I’ve had for a long time in my mind (long before the TamTeach Gear Black Porsche 934 was announced). 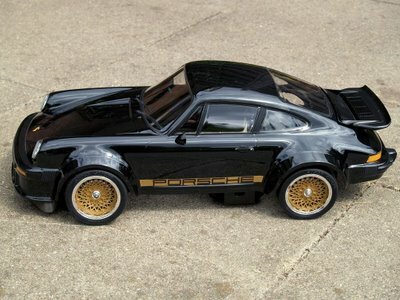 The idea was to make a Black 934 close to the original 58001 concept (i.e. 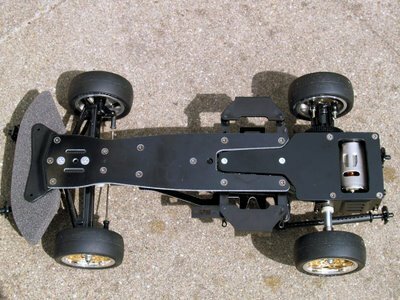 with a simple pan car chassis) but with modern parts, like Tamiya could have made it in the present. 1:10 49400 body and wheels (inner wheels painted to resemble disc brakes) were used with selfmade golden decals and matted black stripe decals. 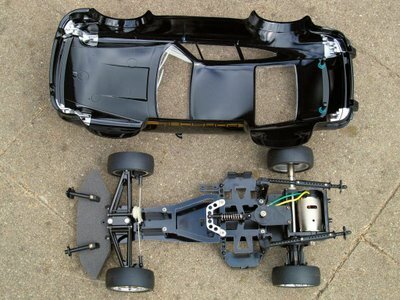 F103GT, TL01 and CR01 body mounts were used in such a way that no body pins and drilling of the body in the upper regions were needed. 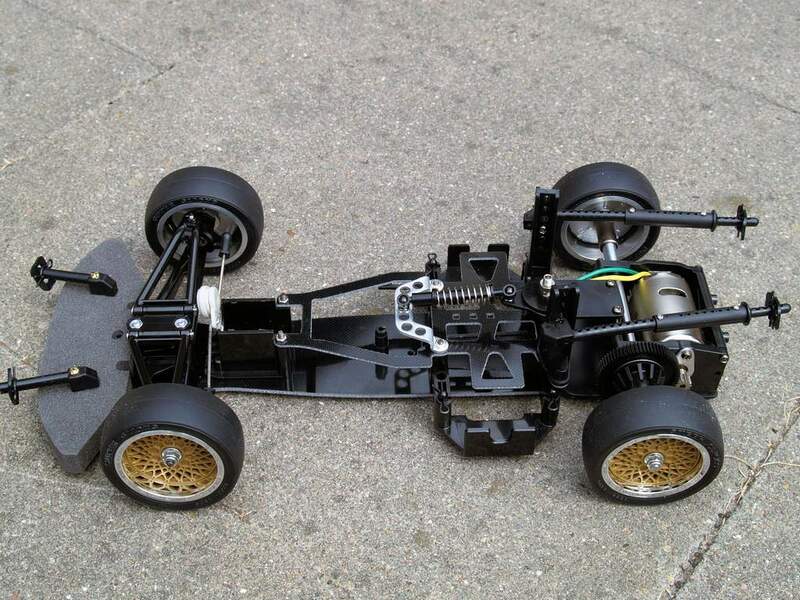 An F103GT chassis was used as it’s the current Tamiya pan car chassis. 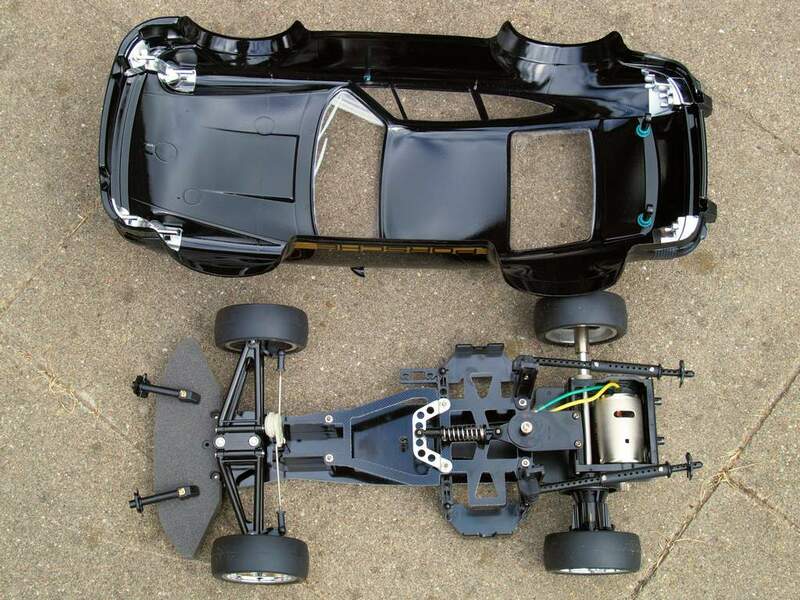 To make it fit the short and wide 934 body, it was widened at the front with TG10 rear wheelaxles modified on a lathe and with spacers in the rear. The wheelbase was shortened with a custom made powerpod and T-bar and by turning the gearbox 180°. 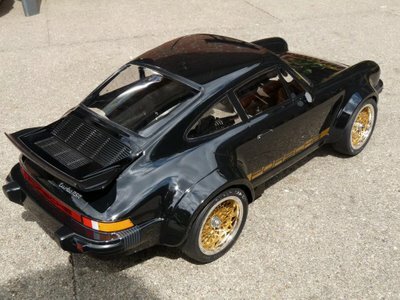 This way the chassis (I call it F103GT-SW) is also not mid-engine anymore, but rear engine, as a 911 should be. This isn’t a perfect performing runner but another concept of the Tamiyablog series “how could Tamiya have done it nowadays”. I would like to thank Miramar for his support on the technical solutions. Together with its brothers, the orginal Black 934 and the limited 49400. This entry was posted in Customized Builds on June 13, 2009 by admin.